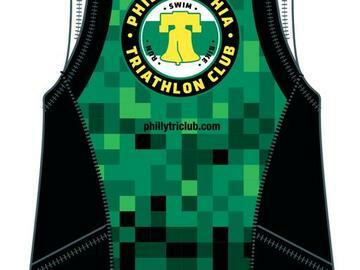 The new PTC standard Triathlon Kits (top, bottom, one piece) with Louis Garneau are available to order. We will provide several opportunities for you to pick up gear at upcoming club events. There can also be arrangements made for shipping. Shipping details will be announced when kits arrive but we will be keeping shipping costs very minimal. Made with Diamond, a soft, lightweight stretchable knit that provides excellent airflow, the fully sublimated Singlet keeps you dry and comfortable. The crosswise diamond-shaped construction provides the fabric with good ventilation and moisture wicking properties and allows it to dry quickly. The comfort-designed neck and armholes and offset shoulder seams further enhance comfort when wearing with a jacket or vest.